Last week's Newsline reported on the participation of the ITER Director-General in a US Congressional hearing on 6 March focused on the US fusion research program, including ITER. Rarely has such a visit seemed more timely. Eight days later, on Wednesday 14 March, the House of Representatives issued a revised draft of budget legislation that almost doubled US fiscal year 2018 (FY2018) funding for ITER—from the $63 million originally proposed to $122 million. A mere 48 hours later, the draft "omnibus spending bill" had been approved by House and Senate and signed into law by President Trump. 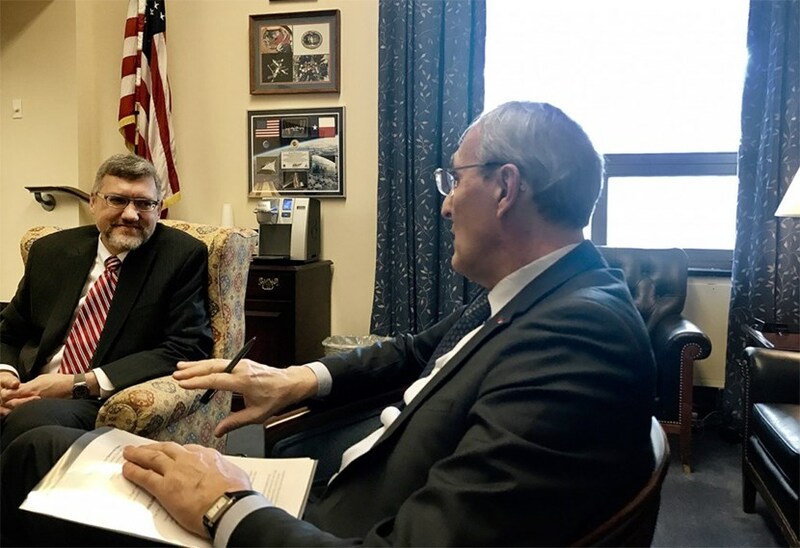 Comparing notes: ITER Director-General Bernard Bigot speaks with Mark Herrmann, Director of the National Ignition Facility at Lawrence Livermore National Laboratory, who was also a ''witness'' at the 6 March Congressional hearing. Of course, cause and effect is never that simple: it would be a mistake to characterize the 6 March hearing as the sole basis for the ITER funding increase. But as ITER Director-General Bigot commented, the increase can be taken as "a strong positive signal," especially since it represents bipartisan consensus across both houses of Congress. Critically, as Bigot notes, "If the $122 million is properly applied, we should be able to avoid any delays to the ITER schedule in 2018." The new legislation did not attempt to address the shortfall in US in-cash contributions for 2016 or 2017. The Director-General hopes this will be addressed soon, when the US finishes its review of ITER under the ongoing Nuclear Energy Policy Review. On a broader note, it is also worth noting the increases to overall US science funding as part of the same legislation. The Department of Energy's Office of Science, which had requested about $5.347 billion for FY2018, was allocated about $6.260 billion, a sizable increase. Within the Office of Science, Fusion Energy Sciences also increased sharply, from the $310 million requested to about $570 million. Additional details can be read here. (For Fusion Energy Sciences and ITER, see page 40).